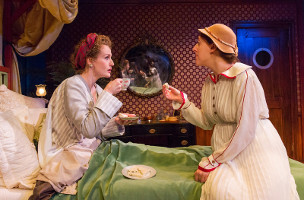 Brenda Meaney and Clemmie Evans in "The New Morality" by Harold Chapin. Photo by Richard Termine. “The New Morality” by Harold Chapin, directed by Jonathan Bank at the Mint Theatre, 311 W. 43 St.
Sept. 21 – Oct. 25, 2015. Performances are Tuesday through Thursday at 7 PM, Friday at 8 PM, Saturday at 2 PM & 8 PM, and Sunday at 2 PM. Special added Wednesday matinee on October 14 at 2pm. Tickets are $55 with some half-price tickets (CheapTix) and Premium Seats ($65). Call 866-811-4111. For more information: www.minttheater.org. Jonathan Banks has uncovered another forgotten gem in the attic of old plays and has brought it to the Mint Theatre in a lively production, which he directed. Harold Chapin was the son of the famous suffragist Alice Chapin, who escaped to London with her two children after divorcing their father. Chapin became a child actor and then a celebrated playwright, with ten one-acts and four full length comedies of manners before he died at the age of 29 in World War I. The critics wrote his play crackled with the “fireworks of wit” and strove for social reform. “The New Morality” is about the modern, independent New Woman, who is “seductive and contradictory.” Certainly Mrs. Betty Jones (Brenda Meaney, whose credits include “India Ink” on Broadway and “Venus in Fur”) is charming and confusing as she refuses to leave her bed in the opening scene. She has committed a social crime – publicly insulting the woman on the neighboring houseboat on the Thames. Her husband (Michael Frederic, seen in “Bill W and Dr. Bob”) is sure the problem is the excessive summer heat, not his actions. Alice (Clemmie Evans) is a loyal friend, coming to visit despite Betty’s new position as pariah. She admires Mrs. Jones’ courage. Betty does seem a little mad to us in the first act, a jealous woman out of control who used shocking profanity (for 1911) in a confrontation that the whole riverboat community witnessed. When E. Wallace Wister (Ned Noyes), husband of the abused woman, arrives demanding an apology and threatening a libel suit, Betty’s adamant refusal to bury the dispute seems out of proportion. Betty, on the other hand, is totally engaging, laughing and clear about her position, When her brother, a lawyer (Christian Campbell), arrives, summoned by the distressed butler (Douglas Rees), the situation seems excessive and not likely to find an easy resolution. Everything changes in the surprising and totally delightful third act. The act also can boast maybe the best comic drunk scene I have seen. Ned Noyes is a gifted comedian who knows the power of subtle gestures, timing that is a little off, and confusing speeches that make us try to listen while we laugh. There is, says Wister, a new morality that has little to do with fidelity and all to do with protecting the ones we love from ridicule and mockery. He mentions suffragists – an allusion to Chapin’s mother – and other brave women who are willing to forego tradition to fight for what they hold dear. Betty emerges a hero, and the insurmountable problem has an unexpected champion. The play is well directed by Jonathan Banks with an impressive cast. Lovely detailed sets by Steven Kemp on the small stage and dialect coaching by Amy Stoller. Don’t miss this one. With so many plays overloaded with gimmicks, trendy hodgepodge, and scenes designed to shock, it’s a relief to see a comedy that has something to say and says it gracefully.